A. VA Cash Benefits For Reimbursement of Burial Expenses - $300 is available for an honorably discharged veteran, IF: they were in receipt of VA non-service-connected disability pension benefits or service-connected compensation benefits at the time of death or IF the death occurred in a VA hospital, or VA contracted health care facility. Additional costs of transportation of the remains may be paid. B. Active Duty or Service Connected Death - $2,000 is available IF the veteran died during active duty; or is an honorably discharged veteran and died as a result of a service-connected injury. C. Burial Plot Allowance - $300 is available for an honorably discharged veteran not interred in a cemetery that is under the jurisdiction of the US government, IF: the veteran was receiving VA non-service-connected disability pension or service-connected compensation benefits at the time of death or IF the death occurred in a VA hospital, or VA contracted health care facility. 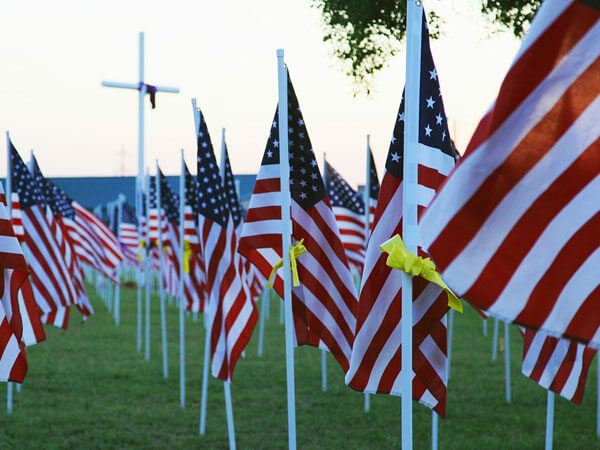 D. US flag - An honorably discharged veteran is entitled to a US flag provided by the Veterans Administration. E. Headstone or Marker - In a National Cemetery, a veteran, spouse of veteran, and dependent children receive a free headstone. For burial in a private cemetery, a simple marker for veterans ONLY will be provided, if allowed by the cemetery officials. Reserved space for future inscription of spousal data may be allowed. The grave no longer has to be 'unmarked' unless the death was prior to September 11, 2001. F. Burial in a National Cemetery - Free space is available for a veteran, spouse and dependent children (except Arlington). At the time of death, we will notify the US Department of Veteran Affairs.